Just some highway patrolmen, and a shotgun. I’ll admit that I’m not really a fan of low-brow humor. 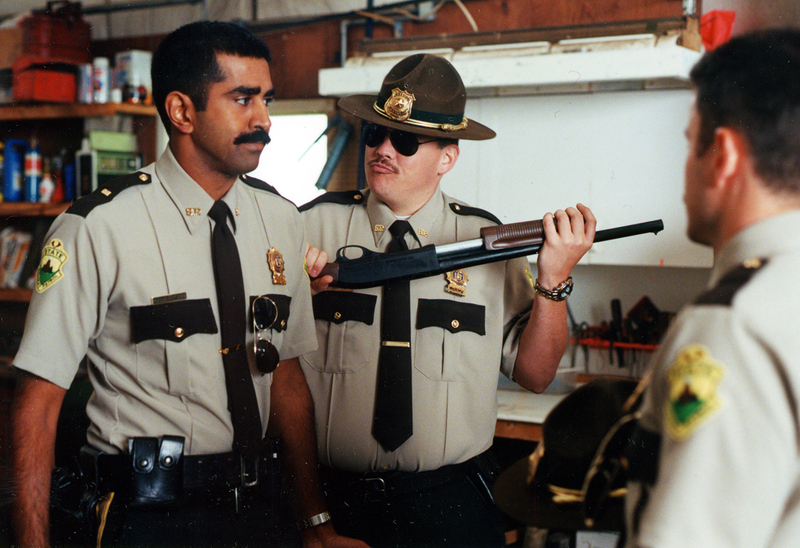 However, I decided to check out Broken Lizard’s Super Troopers based on the recommendation of a friend. It is tough times for the state of Vermont, and a highway patrol precinct is in danger of getting downsized. When it seems a drug ring is running its merchandise in the jurisdiction of Captain O’Hagan’s (Brian Cox) precinct, it is up to five troopers (Jay Chandrasekhar, Kevin Heffernan, Steve Lemme, Paul Soter, and Erik Stolhanske, aka Broken Lizard) to save the reputation of the precinct and in turn save themselves from the axe. Things get complicated when local municipal police start encroaching on their duties. The main reason I was hesitant to see this movie is because I was expecting a cop comedy much in the flavor of Police Academy (1984), but I will say Super Troopers was much better. In general, the jokes were more intelligently written and had impeccable timing. One memorable scene was when O’Hagan threatens his officers with a pistol whipping over the use of the word “shenanigan”, but another scene that was priceless was the distraction Rabbit (Stolhanske) provided while the officers were stealing evidence from the local police station. The acting talent was terrific as well. Brian Cox, known for dramatic villains like that in Rob Roy (1995), demonstrated himself to be a perfectly capable comedian. However, it was Broken Lizard that really stole the show. I really praise Chandrasekhar (who also directed the film) especially in his role as Ramathorn. Where Chandrasekhar succeeded where Kal Penn (aka Hollywood’s trademark funny Indian guy) failed is by being an Indian actor who was funny without having to really use his race for humor; the same role could have been played by a non-Indian actor, but I thought it really fit Chandrasekhar like a glove. Overall, Super Troopers is a well thought out low-brow cop comedy, and was in general better than Police Academy. The plot was paper thin, and I called the ending out about halfway into the movie. Still, that was not what the movie was all about, and for that reason I say it’s worth a viewing.